Specially designed to cater to babies and toddlers under 24 months, the room gives the youngest children a safe and secure place to explore and learn with regular visits to the main room. The whole nursery enjoys eating and playing outside together, with staff providing extra care for the little ones. Our staff build strong bonds with babies, ensuring there is regular honest consultation with parents to enable home routines and preferences to be maintained. They are committed to the happiness and wellbeing of your baby, providing daily entries to your baby’s personal diary to keep you up to date on progress and milestones. We pride ourselves in tailoring a development plan to your baby, using the beautiful surroundings to enhance their journey including walks and visits to gardens on the heritage site grounds. After 24 months, once the child is ready, they progress into the main room where they would join the Ducks (2+). If your child is moving up from the Ducklings room, staff would carefully plan the transition with you to ensure it’s a smooth and happy change. The main room has been split for the ducks, with several different learning areas that all encourage children to learn in their own unique and fun way. Being in a large room with the Swans, helps the children build strong and lasting relationships with staff and friends, with our values and ethos encouraging positive behaviours throughout. 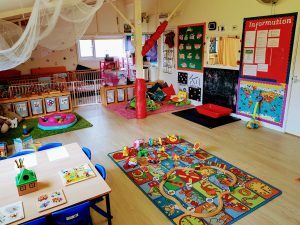 The exciting environment provides a fantastic platform for the children to develop their language skills, learn to make informed decisions, have fun group play, enjoy quiet reading time and rest when required. The Swans have their own area of the main room, split by a mini fence. At the age of around 3 years old and if the child is ready, they will start the transition to the Swans. 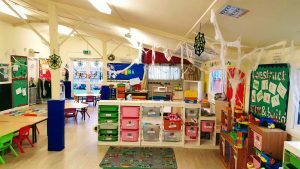 An area full of resources for the older kids, arts and crafts, water and sand play, reading and heaps of learning, the room is provides the pre-school children with everything they need to develop into confident and happy children to take on their school career. Staff often take the children on walks around the heritage site gardens, sometimes spotting the local wildlife. The staff have a great programme to aid pattern and number development, growing your child’s confidence with lots of encouragement. The room has direct access to the secure outdoor play-area where they grow their own plants and vegetables and explore the grounds. There is an ever-changing range of toys and activities to help the children fully develop both emotional and physical characteristics. Puddleducks provides more than just day care- we offer a full pre-school curriculum.